Jeroen van Erp graduated from the Faculty of Industrial Design at the Technical University of Delft, the Netherlands in 1988. In 1992, he was one of the founders of Fabrique in Delft, which positioned itself as a multidisciplinary design bureau. He established the interactive media department in 1994, focusing upon developing websites for the world wide web - brand new at that time. Under Jeroen's joint leadership, Fabrique has grown through the years into a multifaceted international operating design agency. It currently employs more than 100 staff of artists, engineers and storytellers working for a wide range of international clients: from ING Bank to the Rijksmuseum, from the National Gallery and Tate in London to the city of Agra in India, from Giant Bicycles in Taipei to the Louvre Abu Dhabi. Fabrique develops visions, helps its clients think about strategies, branding and innovation and realises designs. 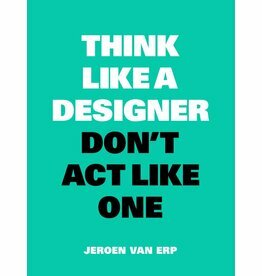 Preferably cutting straight through the design disciplines, so that the traditional borders between graphic design, industrial design, spatial design and interactive media are sometimes barely recognisable. In the bureau's vision, this cross media approach will be the only way to create apparently simple solutions for complex and relevant issues. The agency also opened a studio in Amsterdam in 2008 and one in Rotterdam in 2012. In the past 15 years, the agency received over 150 international awards, among others 35 IF’s, 15 Red Dot’s and several European Design Awards. In may 2015 the agency got a prestigious Webby Award for their Design of the website of the London Design Museum. Jeroen is currently partner and innovation strategist. He is also the chair of the Dutch Creative Council and a board member of the Design & Emotion Society and What Design Can Do.